New Covent Garden Flower Market is delighted to reveal the identity of the five outstanding florists commissioned for the Flower Market Photoshoot of British Flowers Week 2016. Over the course of the British Flowers Week campaign (13-19 June), their designs using British flowers will be revealed online at www.britishflowersweek.com and on social media using the hashtag #BritishFlowersWeek. Rob Van Helden of Rob van Helden Floral Design: A Dutchman abroad, Rob Van Helden is one of the world’s leading event florists, masterminding the floral decoration for glamorous, exclusive events from London to Mumbai from his flower studio in Battersea. Amanda Austin of Amanda Austin Flowers: The actress turned florist with a miniscule flower shop on Kings Road and a cavernous studio in Vauxhall, Amanda Austin is one of London’s most highly respected florists and the preferred supplier to the most exclusive venues in town. Florence Kennedy, Petalon: Dubbed London’s hippest florist, Florence Kennedy is a true floral entrepreneur, running a thriving flower business delivering beautiful bouquets by bike to addresses across London through a fleet of apparently gorgeous cyclists. Anna Day & Ellie Jauncey, The Flower Appreciation Society: Art graduates who met by chance in a Hackney pub, Anna and Ellie have created a fun, creative and original business, designing flowers for events, styling for product launches and writing a bestselling book. Philip Hammond of The Dorchester: The youngest designer florist in the history of the iconic luxury hotel, Philip Hammond creates the magnificent florals that adorn The Dorchester from the bedrooms to the ballrooms and the famous Promenade for Afternoon Tea. National Trust’s Knightshayes, Devon: The house will be decorated throughout with British flower displays created by its volunteer flower arrangers from the Knightshayes cutting borders. (13-19 June) Usual entry fee applies. The Flower Hive Flower Crown & Flower Rings, South Wales: Taking place on Cowbridge Community Allotments, this is a free family-friendly event with an informal workshop to fashion flower crowns and flower rings, followed by a community picnic. (18 June) FREE. Tallulah Rose Flower School - A Day on the Flower Farm, Somerset: Bath’s renowned Flower School invites guests to a day at Manor Farm Cottage Flowers, picking up tips on growing and arranging British flowers and (16 June) £150 including lunch. To mark the start of British Flowers Week on Monday 13 June in style, The Dorchester, London’s famous luxury hotel, will be decorating its beautiful Promenade with exquisite arrangements of British cut flowers. Guests for Afternoon Tea will be treated to the sights and scents of the finest British flowers in magnificent floral urns and table arrangements throughout the week, and The Dorchester will be selling British Flowers Week bouquets online and at Parcafé at The Dorchester. Day Two of British Flower Week will see British flowers and foliages at the heart of government, as the British Florist Association and students from Capel Manor College take a vast floral display behind the doors of Number 10 Downing Street. Then from 16-19 June, growers from Flowers from the Farm, the network of artisan cut flower growers, are set to make their floral mark on BBC Gardener’s World Live at Birmingham’s NEC with demonstrations, displays and special British Flowers Week lonely bouquets lovingly placed around the showground. In June 2015 #BritishFlowersWeek achieved a record Twitter reach of 5.4 million up a staggering 750% on the 2014 campaign. 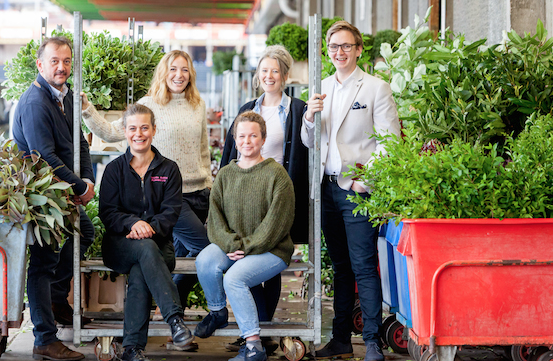 The campaign organisers, New Covent Garden Flower Market, are appealing to everyone to use the hashtag #BritishFlowersWeek during the celebrations to help spread the love for British grown cut flowers further than ever before. British Flowers Week is the brainchild of London’s New Covent Garden Flower Market, where British grown flowers and foliage have been traded for centuries. The British Flowers Week campaign is organised by the Flower Market and brings retail and event florists, flower schools, growers and wholesalers together to showcase the best of British flowers, foliages and floristry. In June 2015, British Flowers Week workshops, talks and floral demonstrations took place in flower shops, on flower farms and in event venues up and down the country. There were British cut flowers, in stately homes in Downing Street and RHS gardens, whilst on Social Media the hashtag #BritishFlowersWeek lit up, reaching 5.4 million on Twitter alone.